As I mentioned in the post on Security Deposits vs Property Damage Protection, like many vacation rental owners we've been very fortunate. We haven't had to withhold anything from a security deposit to pay for damage. We attribute this to thorough screening, and also making sure that guests understand that this is our own home and we are real people. This isn't to say that there hasn't been any damage in our rental properties. Generally it's been minor things from honest mistakes or reasonable wear and tear. 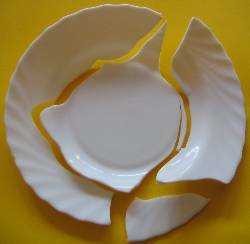 Guests will often conscientiously report a broken cup or plate. We never charge for these kinds of small things. Some larger things have been a door ripped from its door closer, and a power cord wrenched from a TV. In the former case, the wood around the door mechanism had had a pre-exisiting crack forming (The high winds in our area frequently can wrench a screen door from a person's grip. ), so we could see how the damage was not due to irresponsible actions, and so we didn't charge for it. With the TV it wasn't clear when the damage had happened. The most common damage is stained linens or towels. Those are harder to spot, especially when guests strip beds themselves. In the post on stocking for unusual events I mention that we generally leave out stain removers in the laundry room. That pays for itself if guests are able to quickly deal with a stain and save some sheets. You want to do whatever you can to encourage guests to fess up if they have caused damage. The sooner you know the easier it is to deal with. Especially if you have back to back bookings, and might need to arrange with your cleaner to buy something, or for a repairman to visit. If someone is responsible and owns up to it, and is helpful in our making arrangements for repairs to be made, then we're less inclined to charge them for the whole repair. If we find out after the fact (without any help from the guest), we're definitely going to charge them the full cost.